Dynamic Forms provides a simple way for non-technical users to take any paper-based form and quickly build a sophisticated interactive, electronic form that can be published to your SIS portal or outside website. This secure, state of the art e-sign/workflow solution allows you to focus your energies on your students and not on manually moving documents. We have processed over 7 million higher education electronic forms over the past 8 years for all types and sizes of colleges. Our libraries of forms and integration experience allow our clients to realize cost savings and efficiencies quickly. Users are not limited by business hours to accomplish completing required forms—even forms requiring multiple electronic signatures in complex workflows and/or including payments. Non-technical users can customize, design and publish professional-looking forms without the need for programming knowledge. Prefilling form fields using single sign-on functionality not only ensures that the data is accurate, but it also provides a high level of confidence that the user completing and signing the form is indeed that person. Upload form data and/or form images to your back end SIS or imaging system. 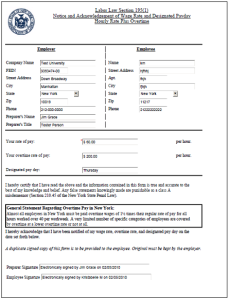 Eliminate data entry and save on the cost of processing paper forms. Use Dynamic Forms for donations, registrations, collections, enrollment confirmation, sales of merchandise, or whatever your payment needs are. We integrate with several payment vendors to provide these solutions across campus. Forms Available 24 X 7: Students/Users have the convenience of accessing and completing your customized forms via the internet on their schedule. Accessible online more saves time, paper, frustration, reprocessing costs and presents a better experience for your students. Student/User Interface: Students/Users can always come into their account and see and print forms they have submitted and signed. 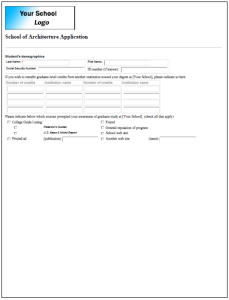 Students/Users will also see any forms which need completion in their Pending area. Multiple Electronic Signatures: Dynamic Forms allows not just a single signature, but our workflow process allows multiple parties to sign forms as well. 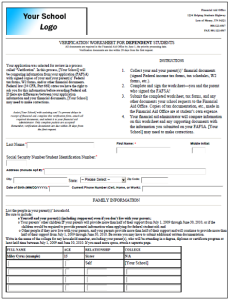 Have a student-to-parent form with a “School Use Only” section form? No problem, Dynamic Forms collects each person’s signature. Single Sign On with School Portal: Students/Users do not have to remember another username and password! Students/Users can be pre-authenticated from the school’s Web site into Dynamic Forms with our single sign on feature. Budget savings: Think about all the things that go into your form processing now. Maybe you have form printing, postage, design costs. Its very likely that you have processing, reprocessing and storage costs. Maybe you staff up during peak to handle this. Dynamic Forms can help greatly reduce if not fully eliminate some of these costs for you. Save your department and your campus money, bring a great success story to your President. Other Savings: Would giving and receiving forms more quickly enhance your process and at the same time enhance your student’s satisfaction with your service level? Giving a financially strapped, an international or irate student an option for quicker service may enhance not only customer service levels but may also enhance the perception of the school to a recruit. Design and Deploy Forms Without Waiting for IT: Use the intuitive Forms Designer to create, update, and deploy forms in minutes. You do not have to take the time for extensive training or need to know HTML code. More importantly, you don’t need to involve IT anytime you wish to make a change. Integrate with your schools systems: You do not have to hire extra support to data enter information from paper forms into campus systems. Our export feature allows you to customize output composition and format to meet your specific data input requirements. This feature ensures you can receive the data in exactly the format you require to facilitate the loading of information to your school information or imaging system. No Hardware / Software to Buy: Dynamic Forms is hosted by Next Gen. IT does not have to worry about support calls, upgrade requests, or purchasing additional servers, memory or software. Stringent third party auditing: Next Gen undergoes a SAS-70 Type II audit annually and contracts with third party vendors to evaluate our applications and network for potential security breaches. Our controls and software have been securitized by some of the best and biggest college and university security personnel around the country. Also, as you would expect, we never sell or share any data from our clients. Campus-wide license: The Dynamic Forms license agreement allows you to use Dynamic Forms across your campus. You can set up several departments (Financial Aid, Admissions, Registrar, etc.) and provide access to their own instance of Dynamic Forms. The incredibly low annual fixed fee, allows you to know your costs, which will likely end up to be a few pennies to completely process a form. Learn more about how Dynamic Forms can enable your online processes. Next Gen brings accuracy, compliance, speed and security to school administrative processes that help students support their education. We set ourselves apart with a customized approach to meet the specific needs of each school, and a relentless commitment to outstanding service.